The Z-8060 High-Impact Particle Weapon (Z-8060 HIPW), alternately known as the Particle Cannon, is a heavy Forerunner directed energy particle cannon used for anti-air defense. Z-8060 particle cannons are enormous floating weapons platforms. They are spherical in shape, surrounded by three curving "arms" spaced at equidistant points around the main gun assembly. The cannons project a hyper-dense beam of negatively charged ions to disintegrate any target in range. They are slow to turn, however, and are vulnerable to ground-based attacks. A well-placed hit from a small MAC in the central beam port will destroy the device. Interestingly, this particle cannon bears a great resemblance to a certain Forerunner portal-generating machine, albeit with its "arms" protruding outwards instead of upwards. 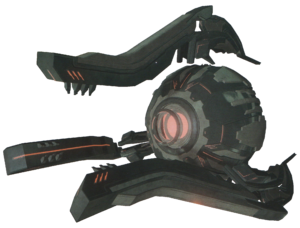 A number of these weapons were encountered on Requiem in use by the Prometheans as anti-air defenses; one of the cannons obliterated a squad of Pelicans in a single hit. Two cannons were destroyed by a M510 Mammoth siegework platform deployed to the surface by the UNSC Infinity, with Master Chief John-117 providing targeting for the Mammoth. These cannons were controlled from a central core via an AI, before it was deactivated by Cortana; causing the remaining two to fire on each other. The Mantle's Approach was equipped with a series of these guns for point-defense purposes. During the New Phoenix Incident, four of these guns protected the Composer from harm against the Infinity and Battle Group Dakota, destroying at least one of the ships in the battle group. After John destroyed the guns by targeting their power sources with an F-41 Broadsword, the Infinity was able to move in close enough to blow a hole in the hull of Mantle's Approach for John with the ship's primary MAC guns. The particle cannon's overall design bears a great deal of resemblance to the description of an Onyx Sentinel. Concept art of a Forerunner anti-air particle cannon in Halo 4. Concept art of the Mantle's Approach's point-defense particle cannons in Halo 4. A particle cannon on Requiem. A view of a particle cannon on Requiem. Another view of a particle cannon. An M510 Mammoth encountering a Particle Cannon. A Particle cannon firing on a Pelican.